Professional Dashboard Reporting Templates for Excel allow managers to step back from the details and see the key trends and relationships that drive their companies. The reporting techniques include workbook templates and tutorials to create professional Excel reports for management and presentation purposes. Excel can be used to create great looking magazine quality reports and also improve cash flows and bottom line profit. Six key drivers to improve bottom line profit with professional Excel reporting are detailed in the reference material. Data can be obtained from Excel or OLAP databases with simple updating routines. Excel dashboard templates can include data from any number of different sources in one report. Excel dashboards can use any number of built-in and third party spreadsheet functions to perform special purpose calculations. The professional reporting dashboard templates are created and maintained by Excel users, who understand what the reports mean. The reports can adapt quickly to managers' changing information needs. The reports can trap errors that normal reports typically ignore. There are real benefits for business users of Excel. 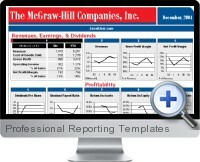 Professional Reporting Templates for Excel provides everything to create customized dashboard reports. The first few chapters of the 150 page book explain how to set up the building blocks: small charts, 'Camera Tool' objects, colors, workbook structure, and more. The middle chapters explain how to link a report to an Excel spreadsheet database, how to easily update a report and how to trap errors in a report. The ending chapters explain how to create a professional dashboard reporting template from scratch, and they provide many charting and design examples. A popular dashboard reporting template is also included in the kit. This enables a quick start to producing professional reporting templates with Excel. The report normally is printed in color, but it looks great when printed in black and white on a standard laser printer. How to use INDEX and MATCH formulas with range names to return data from spreadsheet databases. How to display adjacent tables that use different column widths and row heights. How to create and print 'Mini Briefing' books -stapled reports that are small enough to fit in a pocket. How to add dynamic lists to reports - lists that automatically expand and contract as the amount of data changes. How to update a dashboard report in seconds for each new reporting period. How to error check Excel reports automatically. How to change the standard dashboard provided from one company or division to another - linking in new company financial data. How to create traffic light indicators on live charts and spreadsheets. How to change the color palette to import new colors into Excel for a professional reporting look and feel. How to shrink charts without compromising font size on the axis. How to synchronize charts so that changes in one flow through to others. How to create magazine quality charts for publishing and dissemination. How to print portrait and landscape together to optimize publishing layout.